Python Printable Games has no less than 20 (yes, TWENTY) different Christmas trivia games to choose from. 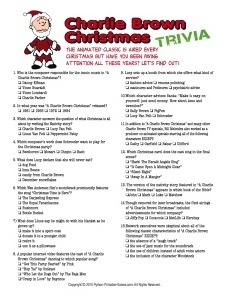 Virtually any holiday subject you can think of is available as a printable quiz. A Charlie Brown Christmas features the loveable Schultz character movie. Questions to test whether you were paying attention all those dozens of times that you've seen it! 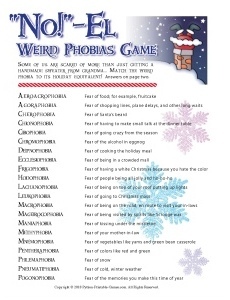 NO!-el Weird Phobias sets you the challenge of matching an odd source of fear to its official word. Afraid of Santa's beard, falling off the roof when you're putting up the reindeer decor, or crowded shopping malls? This game is right up your street! 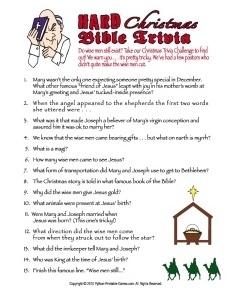 For Christian families, there are three trivia games, including a special HARD Bible Trivia Questions quiz. Even pastors have failed to get all the answers correct! A great challenge to the religious members of your crowd. Games are “shipped” by email. You download, print and play! There's so much more to discover: Christmas songs and music, movies and TV trivia, James Bond games (for those of you who watching 007 is a holiday tradition), lots of quizzes for kids and teens... there really is something for everybody here. And, if you ARE shopping for everybody, here's some great news. You can get all of Python's Christmas and New Year games for just $19.95! 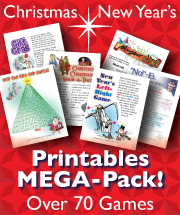 That's more than 70 printables, including coloring pages, paper dolls, all 20 printable Christmas Trivia games, loads of party ice-breaker and gift exchange games, mad libs, Christmas puzzles and much more!